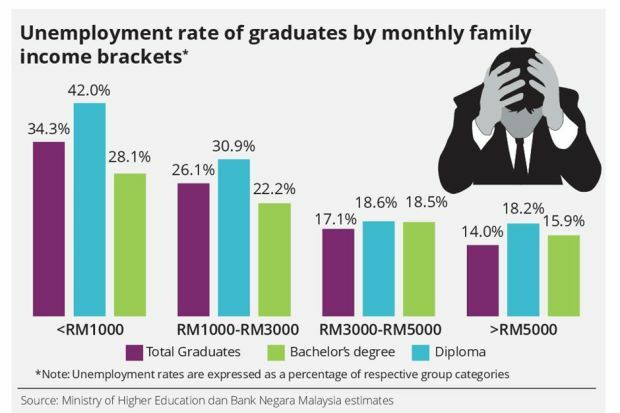 PETALING JAYA: Youth unemployment was at its highest ever at 10.8% in 2017, of which graduate unemployment constituted about 40.5% or 204,000 of total unemployment due to skills mismatch amid a backdrop where demand for low-skill jobs continues to reign – which in turn may leave the government falling short of its 35% skilled workforce target by 2020, according to MIDF Research. For every 100 jobs available, there are 76 jobs for elementary occupations and 10 jobs for plant and machinery operators and assemblers, which leaves 14 jobs for the high-skill and other low-skill occupations. About 86.3% of job vacancies in 2017 were for low-skill jobs which was deemed less suitable for a fresh graduate while high-skill jobs such as professional, technicians and associate professionals, comprised 4.1% of the total job vacancies. It noted that the high single- and double-digit unemployment rate among youth, defined as those between 15 and 24 years old, as being normal not only in Malaysia, but in Europe, the US and South Korea. The high youth unemployment rate was mainly contributed by soaring graduate unemployment, despite the steady increase in tertiary-educated workers joining the workforce, which was also the fastest growing segment at 4.1%, followed by secondary at 3.2% and no formal education by 0.3%. Employment share of professionals and technicians and associate professionals improved to 12.2% and 10.5% in 2017 expanding at 0.8% and 4.6% respectively. “In terms of share, the rising stake of skilled-worker or tertiary-educated is in line with the Eleventh Malaysia Plan. Under the plan, the government estimated skilled-worker to total workforce ratio to touch 35% by 2020. Nevertheless, we view the ratio is not expected to reach the target at the current pace,” MIDF Research said. “We forecast the skilled-worker ratio to register at 32% by 2020. Continuous improvement in production efficiency, resource allocations and better technology adoptions under the Industry 4.0 will facilitate and accelerate the productivity level in Malaysia in the long run,” it added. The overall unemployment rate in the country remained low at 3.4% last year. Malacca remains as the state with the lowest youth unemployment rate for the seventh consecutive year at 2.9% while Sabah recorded the highest at 13.5% in 2017. Meanwhile, Selangor the largest employer, 23.2% of total national employment saw overall unemployment rate of 2.8% and youth unemployment rate of 9.4% last year. The overall youth unemployment rate across all states registered poor performances compared with the previous year, 2016. In 2018, the youth unemployment rate is expected to fall slightly to 9.9% and the overall unemployment rate to stand at 3.3%. Prized job: While long-term security like the pension scheme free healthcare and easy loans have been among the perks of joining the .